This project asks two key questions: Why did pilgrimage matter in the past and why does it still matter today? To help answer these questions it focuses on the rich histories and contemporary stories of four important English cathedrals: Canterbury, Durham, Westminster and York. 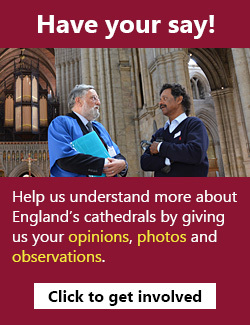 As well as exploring the experience of pilgrims in the past, the research team is also asking those visiting and managing cathedrals today to share their own experiences and views through this website. Discover more about the project, its aims and those involved. See where we've been and what we've been doing via our blog. View and upload photos about pilgrimage and visiting cathedrals.